Lose weight - I'm aiming to get down to 15 stone, through those wonderful things, diet and exercise. Play more tabletop games - I want to try to organise to at least play board or card games once a month, I love playing tabletop games, it's an inexpensive way to have fun with friends and family, so I'm going to try to sort this out. Increase views of my blog and videos - I did set myself a challenge of 600k blog views by the end of the month (looks like it'll be about 573k) and 14k video views (and I'm on 13,415) so they haven't quite got there. I'm struggling, as I suspect many people do, with engaging readers. By all means, if people have any suggestions as to blogs or videos that they'd like to see, or maybe they'd like to do a guest blog/vlog, let me know. Learn to swim - no, I can't swim. Neither can I ride a bike, but I have a car so I don't see that being a big issue. However there is a possibility that I could drown, and a car would be particularly unhelpful in a drowning situation. Study at Oxford or Cambridge (preferably Cambridge). I'm not talking actually going there, as much as I'd love to, but perhaps a distance learning or online course, or even a short residential course (they do concentrated weekend courses on subjects). I am a bit of a snob perhaps, a lot of people that I admire studied at those universities and whilst I can't see myself being able to get there to study a full degree or anything, some sort of study programme at one of the two would be great. Visit the USA and Canada. Over the last few months I've been doing a lot of reading about these countries, and I would love to visit them, perhaps on some sort of long holiday (2-3 weeks maybe). There's so many places in both countries that I'd like to visit that I can't see us doing everywhere in one trip, but perhaps we could break it down over a number of years. 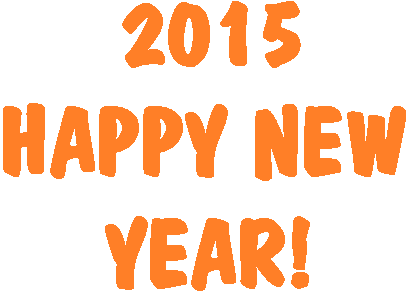 Do you have any plans for 2015 or new years resolutions? Drop me a comment and let me know. I should say that I will be doing my 2015 predictions video imminently (possibly tomorrow morning if I get chance, otherwise it'll be New Years Day), so if you do have a question about your 2015 that you want including on the video, do let me know asap, get it in the comments. And before I finish, New Years Eve is coming! I've done a video of advice, covering phones, taxis, and even signing Auld Langs Syne. Be warned - if you listen carefully near the end you can hear a child counting monsters. Its already 2015! ah, how time flies. I never believed in new year resolutions until now because I always felt that I wasn't self motivated for the entire year. This year, I'm changing that.